It begins as a gentle whisper, and culminates in an earth-shattering insight! The stories in this book will take your breath away and their lessons will touch the divine vibrations of your heart and soul. These are more than just stories--they are intense, life experiences, filtered through the lens of enlightenment and insight. In these spectacular stories you will see how Divine guidance leads each of us down a certain path--with often miraculous results. What did the author’s father tell the priest that made the two weep with joy? How did an apple and a Reader’s Digest give proof of G-d’s existence? How do we get inspiration and spirituality from every aspect of our lives? 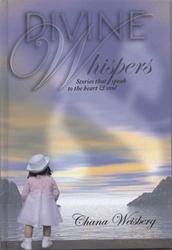 Read this book and feel the divine whispers resonate within your own self.